IIN Swirl Carving Template for you to use on your pumpkin! Just be sure to send us a photo! Halloween can be a tricky holiday. The omnipresent candy, the festive parties, and the excited enthusiasm of costumed kids can make us go overboard on treating ourselves – especially since we can rationalize that the holiday comes but once a year. Truly, Halloween is a good time to treat yourself and your kids - not just with a little extra candy, but also with family activities. Bob for apples, tell spooky stories, or have a mini pumpkin hunt! Halloween definitely doesn’t have to be scary for your health, which is why we’ve compiled this list of tips and recipes to help you moderate the treats and avoid the tricks. Want more? The Integrative Nutrition community will discuss more tips for a healthy Halloween on Thursday, October 20 during a free webinar. Register for Tricked by Halloween Treats? Not This Year! to reserve your spot! The trickiest part of Halloween is keeping yourself and your kids from going nuts over all that candy. It's in the grocery, the drugstore, and practically pouring from every nook and cranny, all shiny in neat individual wrappers. One piece seems so small, almost harmless. Of course, it comes in a bag with 50 or 100 other tiny "harmless" pieces. 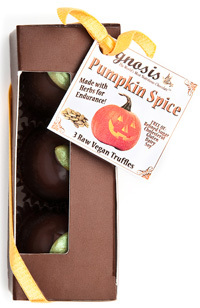 Take heart, though - we have a few ways to tackle the Halloween-candy blues while still allowing a little festive indulgence. 1. Buy a candy brand that you don't particularly like to eat for handing out to the trick-or-treaters. Candy corn if you're a chocolate lover, or Milky Ways if Bit O Honey is your downfall. You'll be more likely to leave some for the trick-or-treaters. 2. Handing out apples might lead to an egged house, but non-edible options like stickers or yo-yos can be good for treat bags, too. Maybe include an organic lollipop or even a mini Larabar for good measure. 3. Go small. If you hand out something in really small portions like Hershey's Kisses, not only will you be giving less sugar to the neighborhood kids, but you can also enjoy a few chocolate morsels yourself without much guilt. 4. Buy better candy for only yourself. You really want to waste your candy calorie budget on a few 3 Musketeers that have been sitting on a warehouse shelf for who knows how long? Have a small stash of quality chocolate, and you'll be less likely to break into the cheaper stuff. For extra benefit, choose dark chocolate - it’s delicious and loaded with health promoting flavonoids. May we suggest Gnosis or Nibmor? 1. 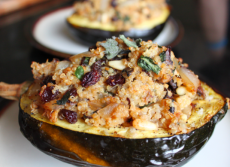 Eat a scrumptious, filling meal before you and your kids hit the pavement. Both of you will be less tempted to munch on candy while you go door-to-door. 2. Upon arriving home after trick-or-treating, let your kids pick out 5 or 6 pieces of candy to enjoy that night. Then pop their bag in the refrigerator. The candy will still be good out of the fridge, but they won't be able to eat it as fast. Younger kids may also forget about their stash altogether - out of sight, out of mind. 4. Buy the remainder candy off them. Your kids might be happy to trade their hard-earned candy for cold cash, a new toy, or a promise of a trip to the zoo! 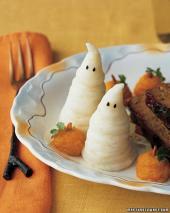 Check out our Fall Recipes eBook for more great Halloween dishes! How do you plan to enjoy a healthy and fun evening come October 31? We wish you and your family a very safe and Happy Halloween!